Several years ago, I was working full-time in a corporate environment with a two-hour daily drive. To say it was draining is an understatement. My husband and I had several discussions about me quitting work and becoming a one-income family. The plan was for me to do some virtual assistant work but not to count on any of that money should I make a go at it. 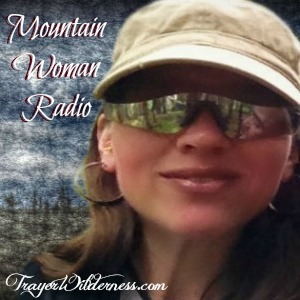 I’ve shared our story in More Was My Catalyst. Check it out for some further background. With the decision to become a one income family I had to learn some new skills. Scratch that – LOTS of new skills. While I knew how to cook I wasn’t the one who did the majority of the cooking when working the full-time job. We were like a lot of households in that we were normal, with consumer debt and a consumption mindset. Debt and no savings. Doesn’t that sound stressful? 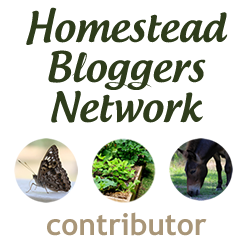 We had to ask ourselves, what steps could we take to reduce that stress and succeed in our plans to start homesteading? 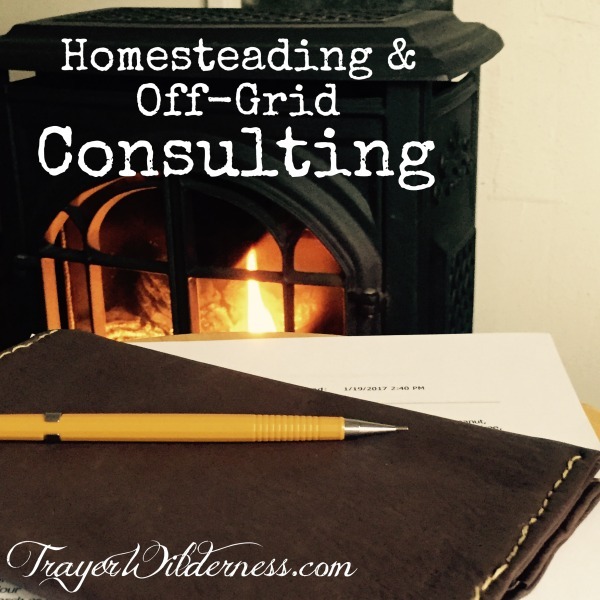 June 2014 began my foray into being a homesteader and home economist. All the skills needed to be successful in both endeavors don’t just happen overnight. Well not most. 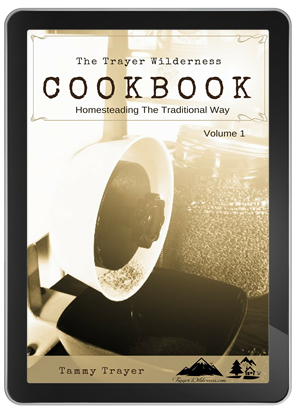 The first thing I had to do was become more proficient in cooking from scratch. And while I was pretty good at planning and organizing I had to get better. 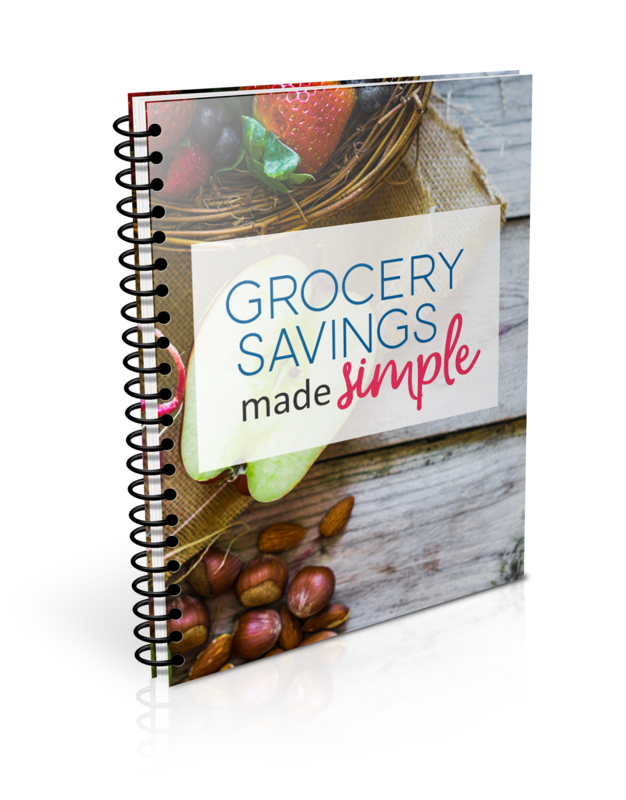 Menu planning is of utmost importance when trying to reduce the grocery budget. How can a pre-determined menu help lower the grocery bill? Planning helps avoid waste and stretch the food longer. I purchase my bacon from Zaycon Fresh. The packages are three pounds of thick cut bacon. Best bacon ever in my opinion. Anyway, my family cannot eat three pounds for one meal so I’ll cook up the entire package. We can then have eggs and bacon for breakfast, freeze some to have BLT’s in the future, save some to have on a cobb salad, and use some for a bacon wrapped chicken dinner. Yes, I started with three pounds but I’ve also saved myself time to do something else because I bulk cooked that bacon at one time. It wasn’t spread over four different meals. 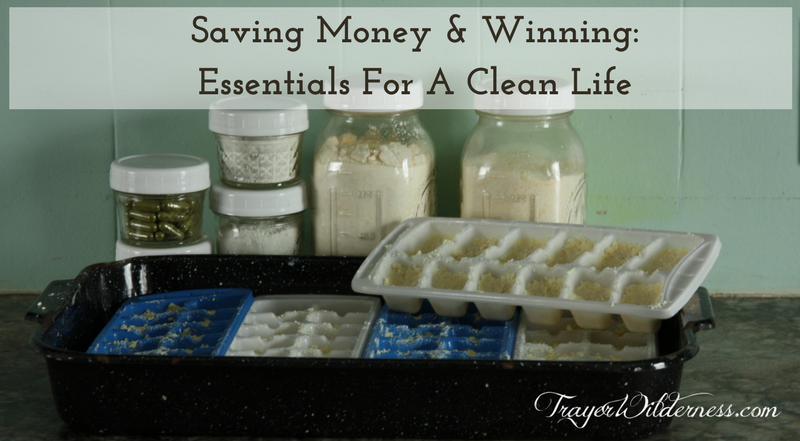 Want to know another way to make food stretch and save money? Buy a whole chicken instead of the parts. It’s much cheaper and you get more meals out of it. Cook the whole chicken. That’s meal one. Use the leftover chicken for chicken salad, or on a BBQ chicken pizza, pick off the smaller pieces of chicken and freeze to be used later for chicken quesadillas. Or leave it on and use some of the chicken to make chicken soup. Did you know you can use those bones more than once to make chicken stock? Tiffany at Don’t Waste the Crumbs has more great ideas on how to stretch a whole chicken to feed a family. She also has some great suggestions for stretching pork loin and using it in different ways. I hope these examples give you some ideas on ways you can make your money go further. Another great website to check out for budget-friendly meals is Budget Bytes. How else can you save money on groceries? Grow some of your own! Most fruits require a long-term plan, think fruit trees that take several years to produce, but there are some that may produce the first year (although the second year is better) like strawberries and some raspberries. My raspberries produced first year (planted spring and had a small harvest in the fall). If you know you’re going to stay in place for long-term you may want to consider investing in fruit trees. Otherwise, try planting some berries for a quicker harvest. 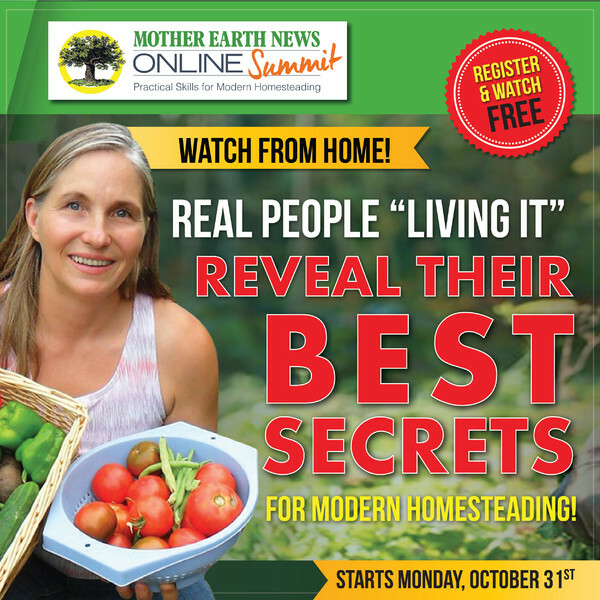 Most people think of vegetables when the topic of growing food comes up. Is gardening easy? Yes. And No. If you have no experience there is a learning curve. 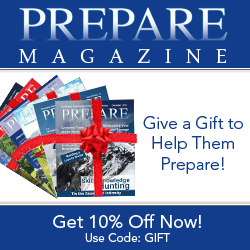 And if you’re really interested in growing food year-round it’ll take research into techniques, what varieties will work best for your particular climate, and by understanding your growing zone! Most people though focus on the summer garden. Which is ok. There is nothing wrong with that at all. That’s mostly what I did the first year. Tomatoes, cucumbers, onions, garlic, peppers, summer squash, and beans were what I concentrated on most. I’ve added on every year since incorporating more of the cool weather crops like broccoli, cabbage, cauliflower, turnips, beets, spinach, lettuce, etc. Have they all been successful? Nope, not at all. But I keep trying. My biggest nemesis has been groundhogs…and weeds. Oh man, those weeds! I could probably write a full page just about my feelings about them. But you know what? I keep trying because it’s so worth eating homegrown food! It tastes so much better. The freshness just cannot be beaten! And there’s a pride to be taken in putting in the work to feed your family high-quality food. And do you know what else you can do with this food you grow? Can it! I just love pulling a jar of crushed tomatoes off the shelf to make my homemade pizza sauce. Best sauce ever! And it only costs about 50 cents (that’s if I don’t grow the tomatoes and buy a bushel from the local farmers market). That’s a pretty good savings from what you can get at the grocery store. I don’t even know what that cost would be because I haven’t bought pizza sauce in three years! Earlier I mentioned cooking from scratch. Do you know how easy it is to make pizza dough? When I was working full-time we would plan our menu (mostly) because we never got home until 6 at the earliest. This means we would get out whatever meat needed to thaw the night before (it’s still a habit) and whatever else needed done. Back then we didn’t make pizza sauce but we did do the dough. We’d make it and then just keep it in the fridge overnight lightly oiled and covered with plastic wrap. I say this to show you that if you are still working full-time you can still do many of these habits. It just takes a little planning. 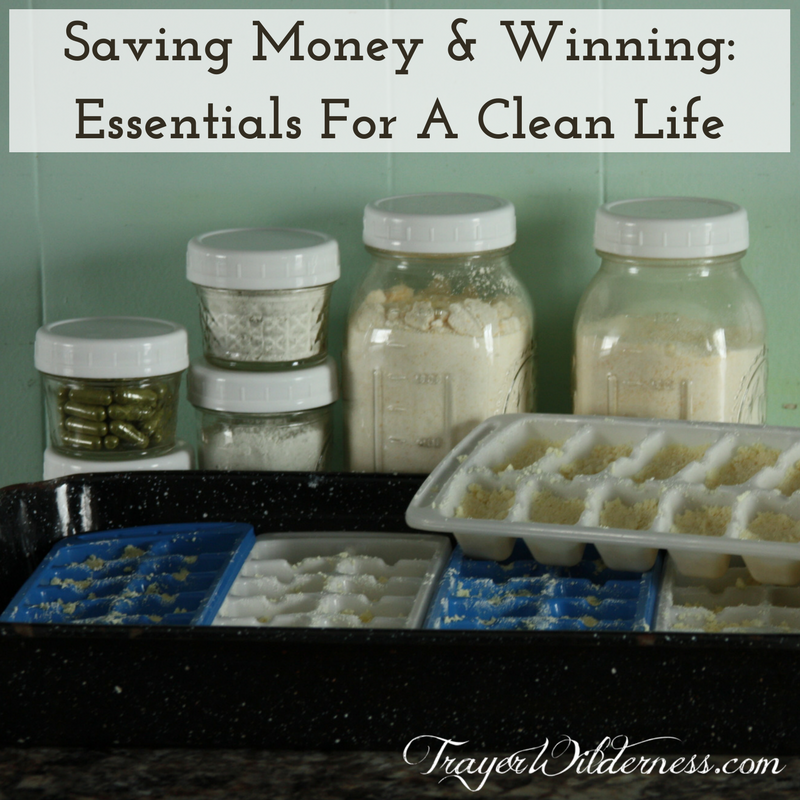 One thing that has also been helpful and this is something we did back before I became “retired” as my husband would say, is to make up several meals to put in the freezer. We’d set aside a weekend to fill the freezer with things like chicken pot pie, lasagna or baked ziti, homemade chicken nuggets, etc. Many of these will yield more than one meals worth. If you find it hard to set aside a whole weekend try to find a day that you can do just a couple meals. It really is worth it. All else fails, double up on dinners (or breakfasts – we make extra pancakes, waffles, breakfast burritos, etc. to freeze for quick on the go meals during the week) and freeze the extra half. Do you know what has been a huge cost saver for us? As a general rule, we don’t buy “lunch” food. I may purchase a package or two of sliced lunchmeat but that’s about it. My husband and daughter usually take dinner leftovers for lunch. 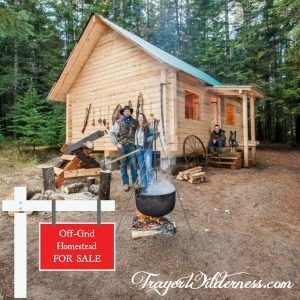 For example, I’ll make a big pot of soup and that will feed us dinner and about two lunches worth for all of us. It’s pretty easy for my husband as he has access to a microwave to heat his lunch. For my daughter who doesn’t have access to a microwave, we purchased a Hydroflask thermos. We have three and have never had an issue with them. They work great for her to have a hot lunch without buying something thru the school cafeteria that is of questionable nutritional quality. It makes me feel really good knowing that my family is eating food that I prepared and possibly grown. If I don’t grow it, I try to get it from the local farmer’s market. I’ve gotten fruits and vegetables, honey, and eggs there. 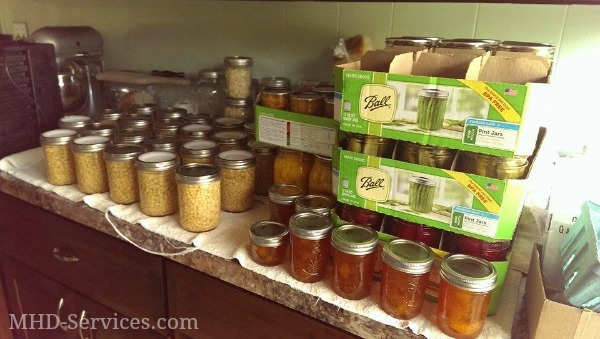 Often times I’ll buy stuff in bulk while it’s in season and at its peak and preserve it by canning, dehydrating, and possibly freezing. For those items that I can’t get from the farmer’s market, I’ll try to find a local supplier (for example, I recently learned that there is an organic grain farm not too far from me so I’ll be purchasing my flour from there). Other items that I don’t have a local supplier, such as cashews, pecans, sugar, dried beans, etc. I’ll purchase in bulk from Azure Standard. It’s just like Zaycon Fresh in that you are given your pick-up time, meet the semi-truck and take your delivery from the back of a semi. It’s really easy and pretty seamless. 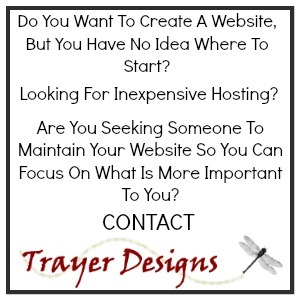 With both, you need to check their website for local drop locations. You’re probably wondering, what about using coupons?? Many people will say that one key to saving money is to clip coupons. 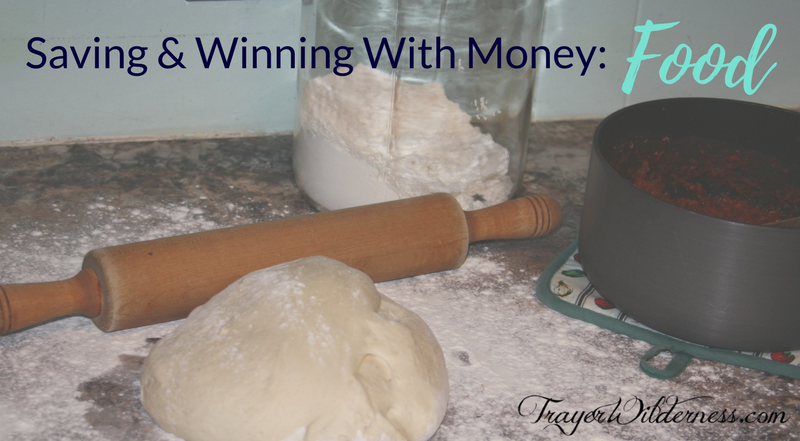 In my experience, you can save some money but in the overall scheme of things, if you’re cooking from scratch and buying store brands vs. name brands, you won’t have much savings. I personally still go thru the coupons but I don’t clip nearly as many as I have in the past. It takes me five minutes to go thru them and put them in my coupon sorter (something I got years ago for $1. It doesn’t have to be expensive!). Then, before I go to the grocery store, I pull out the coupons I’ll most likely use based on my grocery list, which was made based on what is needed (close to being out, what I may be buying extra of because it’s on sale – like pasta, and what is absolutely necessary for the meals on the menu or something that is purchased every week, like milk). This week I had $2.65 in coupon savings. Some weeks it’s only $0.25. In the long run, it adds up. This is a multi-part series on how my family has taken action to save and start winning with money. Next time, I’ll review another area where we’ve achieved some wonderful savings and talk about apps that I’ve used in my endeavor to keep as much of our hard-earned income. 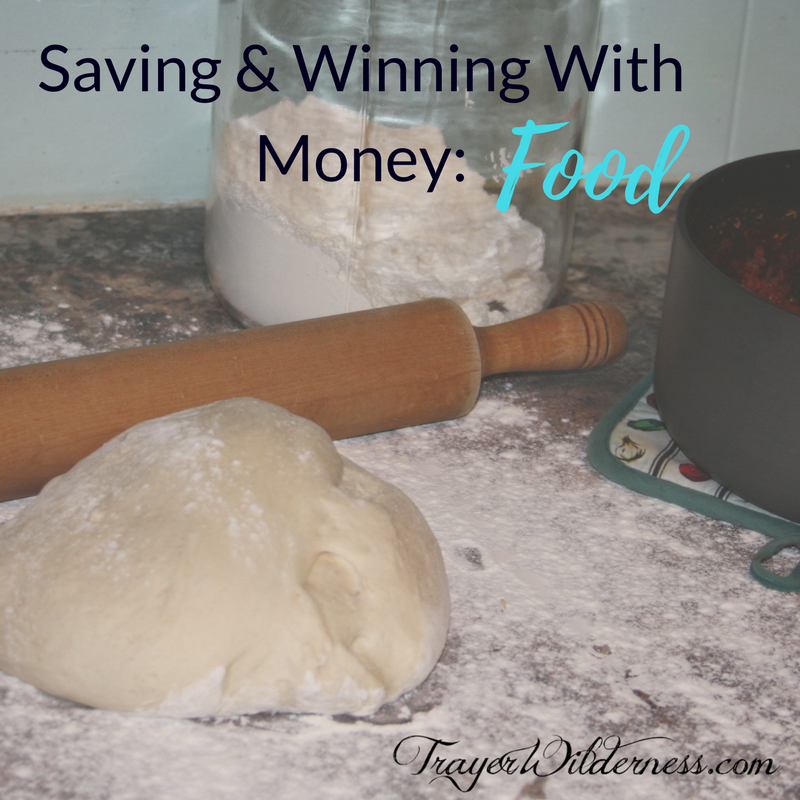 Do YOU have any tips you would like to share on saving money with food? Is there something specific YOU do to control your food costs? 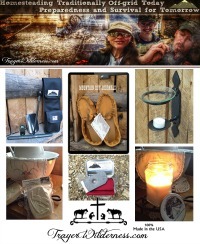 When it comes to our homesteading journey we are at a point now that we’ve learned two lessons. One, things cost more than we thought they would. And two, things take longer to do than expected. Those combined can really impact a yearly goals list. You’ll see what I mean later. 2016 started out with making our Homestead Goals while we were on vacation on Hilton Head Island in South Carolina (my daughter keeps asking to go back so it was a great vacation). Our goals seemed easily achievable. I mean, look at this list, do you see anything that may not be possible? You see that last one? Yeah, that was huge. Anything that required a large amount of money was eliminated. Honestly, this has always been a goal of ours but we were going about it all wrong and NEVER made any headway. So why did we choose to focus on this? Besides the obvious of the wish to be debt-free we want the security of it which translates to less stress. So how to begin the process? It all starts with knowing what debt you have, how much money you bring in, and making a plan. This plan is called a budget. And no, it’s not a bad word. I think many people think of it as such because they’re in denial and they don’t want to face facts. Plus, it’s not fun to live within your means (translation, you have to be patient and SAVE money for those fun things you want to do – like a vacation, or for those toys you want). One of the best things I ever did was begin to listen to The Dave Ramsey Show podcast. From there we were gifted a copy of The Total Money Makeover . 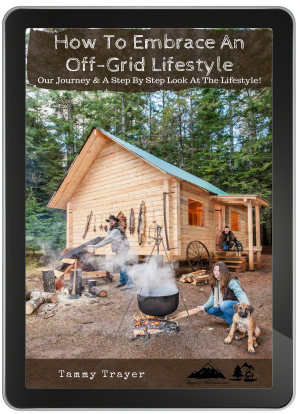 It was a quick read packed full of easy steps to follow. We’ve been committed to becoming debt-free and meet weekly to review the expenses/budget document and create a new budget the last week of every month for the following month. Throughout the month we make notation of those things to be included in the next month’s budget. This is the only way for us to be sure we’re budgeting appropriately every month. And yes, before you ask, there are times that unexpected things come up. There is a line item in the budget every month called Unexpected. Sometimes when that happens and the amount in the line item doesn’t cover what’s needed, we’ll then revisit the budget to see what’s remaining and revise what we can to try to stay on task. It seems that the moment we decided to get serious about kicking out our debt good things started coming our way. Our tax refund was much more than anticipated, my husband got a promotion, and we were given a free pole barn and shed. The catch was that they had to be dismantled ourselves. Our plan was to use those to achieve a couple goals (pole barn & chicken coop). Well, remember when I said that things take longer than expected? Yeah, that was definitely the case. My husband worked hard at dismantling them. Incidentally, he needed a new tool to remove the metal sheeting on the pole barn. That was something we had to budget for in order to purchase. We’ve completely stopped using credit cards. He also worked hard on cutting firewood. A friend of ours contacted us about picking up a tree that had to be cut down at his in-law’s place. Again, this was another one of those good things because it didn’t cost a thing except time and it helped increase our wood stock. And they gave us a hand loading and unloading it. The dismantling of the barn and shed and transporting (had to borrow a trailer that could accommodate the metal sheeting) to our property took a good portion of the year. The base for the shed was put in (basically sand to level the area) and the building of the shed began. The shed before dismantling wasn’t in the best of shape but the bones were good. We did have to replace the sheeting and a few other parts (again, that was budgeted). Right now, the shed is built and painted and patiently waiting for the walls, shelving, and nest boxes to be built inside. So, with all that was going on, how did we do with the goals we set out to accomplish? As previously stated this was a dreaded task. Once I started thinking about it I realized that this goal and the BE MORE ORGANIZED goal were tied together. My struggle with being organized was tied directly to paper clutter. So I went old school and created a tickle file. 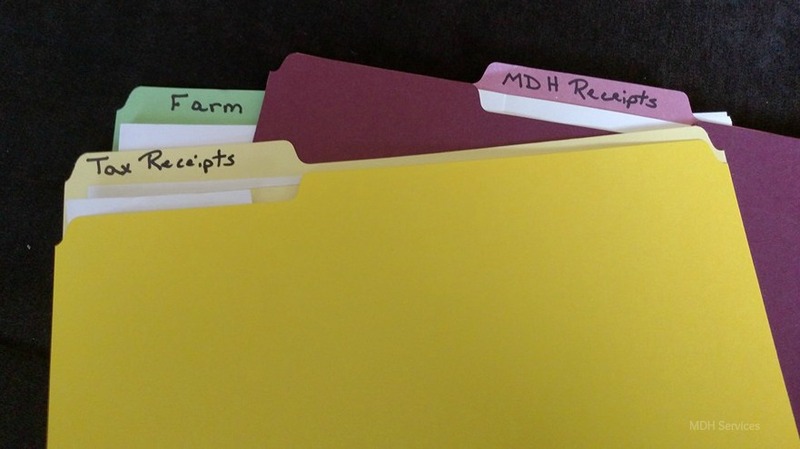 From there I also created folders for tax receipts and documents, medical documents/bills, and other pertinent short-term folders. These were all put into a Sterilite portable file box. This is now my portable office. 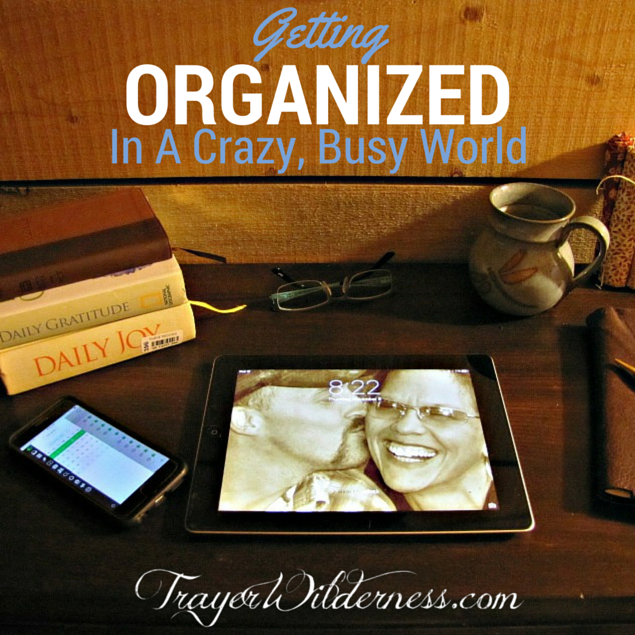 I still utilize my online family organizer (Cozi) but this works in conjunction with it. I can place any document in the respective folder and be able to find it in a flash when needed. Something else that helps clear the paper clutter is to go thru the mail every day as it comes in instead of throwing it in a pile to be handled later. The sooner I can get paper clutter out of my home the better. No more multiple hotspot piles to go thru, no more lost or misplaced bills, etc. I have a specific day every week (Mondays) that I pay bills and do any desk work. Desk work includes making appointments, filling out forms, etc. Did I conquer all my paperwork? Heck NO! I still have recipes and information sheets/articles to organize. It would help if I’d quit printing them out. That’s a whole other issue. We definitely made progress here, however, it’s an ongoing thing. I don’t think this is ever done as needs, wants, likes, and dislikes change over time. The daughter definitely got rid of a lot of toys and we have some things that we want to put up for sale. Now to just take pictures and get them up on Craigslist. This deserves a big check mark as done! My husband did a great job of developing different zones using soaker hose. No more overhead sprinklers which translates to less water usage and healthier plants. In addition, everything was mulched which meant less watering as well. This was mostly achieved. Definitely gathered enough wood but didn’t get it all cut. Mainly due to the time it took to dismantle the pole barn. Yes, we definitely made progress here. And it feels so good to have made strides to be debt-free. Before I move on, I wonder what you consider to be debt. Do you consider a car lease debt? A mortgage? Definitely mortgage is a debt and the sooner it’s paid off the better. I want my house to be free and clear (with the exception of property taxes. We can’t do anything about that). I do consider a car lease to be debt for the sole reason that you pay monthly, when you turn it in you pay a turn in fee, and you get nothing to show for it. You’ve essentially signed a long-term note to rent a vehicle. You don’t truly own it. Unfortunately, that was something we hadn’t truly thought about until last year. That’s why we’ve been saving to purchase a new to us truck without getting a loan. It may not be the newest and prettiest model but until all other debt is gone there’s no reason to waste money to keep up with the Jones’. I can hear you asking how much we actually reduced our debt by. Are you ready for it? I know I was shocked when I ran the numbers at the beginning of January. Just over $17,000! I don’t think we’ll be able to achieve the same numbers in 2017 (for the aforementioned reason that we need to purchase a truck) but I’m confident that we’ll still make some progress. We plan to continue with a couple of the goals that we made progress on in 2016. Try new things/skills: ie. Make & dry homemade pasta, Make soap, etc. Did I mention that we’ve decided not to put up the pole barn that hubby had dismantled? Where we were going to place it we’ve learned has poor drainage and in the spring is a soupy mushy mess. So, the materials will be used for other building projects like the lean-to. Just another way we’re saving money in the effort to eliminate our debt. 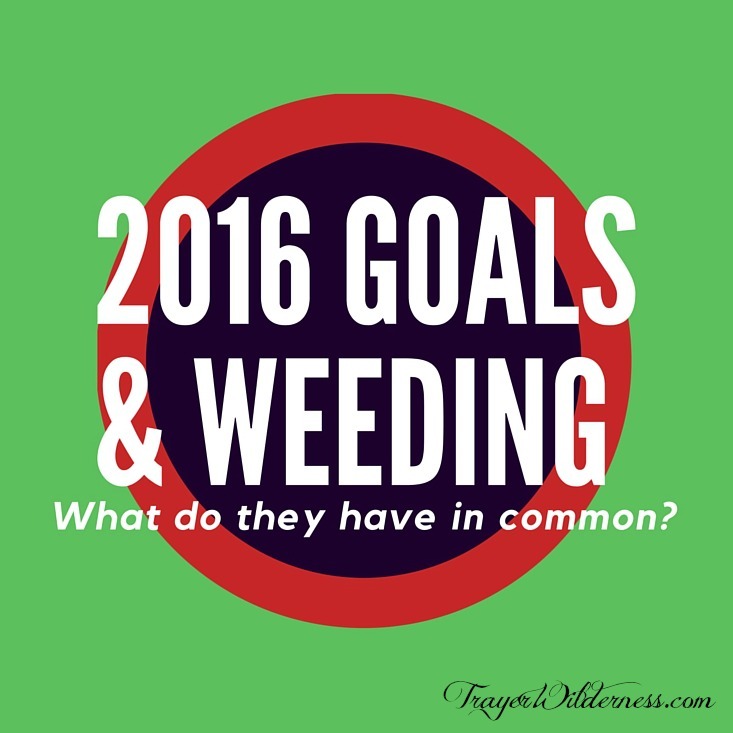 There’s no way 2016 objectives and weeding the garden have anything in common. Maybe not from first glance but really they do. I’ll get to what that is later on. First, I want to share with you (because many have asked) our 2016 goals. We set our objectives for the year on New Year’s Day while on vacation on Hilton Head Island. Does that seem like a long time ago to you? It does to me. Of course, it was June when I wrote this so six months have already passed way too quickly. I’m not going to tell you right now how we’re doing, you’ll have to wait until next year for that. It’s only six months away so I think you can handle the wait. 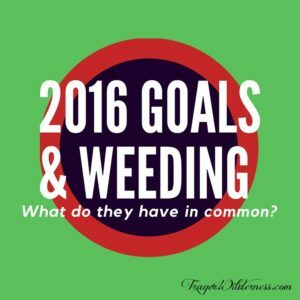 Still not seeing how goals and weeding have anything in common? I’ll get there soon. I promise. Recently I was out in the veggie garden weeding a section that was particularly weedy. As I was sitting there on the ground pulling out more creeping Charlie and grass a few thoughts filtered thru my mind. First, it’s just not possible to not get dirty when gardening. Those magazine articles with the pictures where the woman is wearing white pants while weeding and not a spec of dirt on said pants is just so unrealistic. You all know what I’m talking about. When I weed I’m literally sitting or kneeling on the ground pulling those bad boys out. So by the end of the day my legs are covered in grass clippings or straw and dirt. And it’s sweaty work. Those women in the magazines look like they just came out of a salon. So not the case here. My face is all red and I’m dripping sweat despite many water breaks. It’s hot, sticky, dirty work. Work that I could have avoided. Ok, maybe not avoided but lessened dramatically. How so? Well, I could have mulched this area in the fall. Some good mulches that I’ve used are chopped leaves and straw. 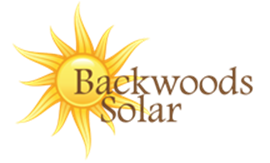 Others that could be used are wood chips, cover crops, or grass clippings. 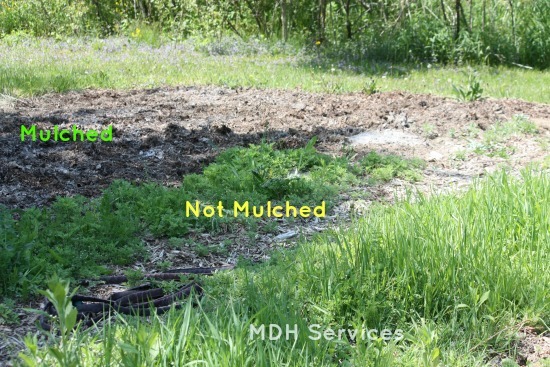 Mulching does a multitude of things from suppressing weeds to retaining moisture in the soil. The reason I use leaves and straw is that I can easily get them either free or cheaply (well, the straw was cheap in previous years, not so this year. Looking for a new source.) And because they break down fairly quickly, especially so in the case of the leaves, they don’t need to be rototilled in. I don’t till for several reasons: I use raised rows and beds with permanent pathways so every bed and row doesn’t get compacted by walking on it, my soil has a clay base, and creeping Charlie. I in no way want to propagate many little new creeping Charlie plants (which is what would happen because it roots so easily) nor do I want to bring weed seeds in the existing soil to the surface. So instead of tilling every year, I typically mulch in the fall which then turns into organic matter. A win win for my garden: the leaves suppress weeds while at the same time feeding the soil. Then in the spring, I can pull back the leaves to plant, then use those leaves to mulch around my veggie plants. When I don’t have enough leaves I’ll use straw, although it doesn’t break down as quickly as leaves. Are you seeing the commonality yet? Maybe I’m stretching a bit, but, planning ahead is key to weeding. 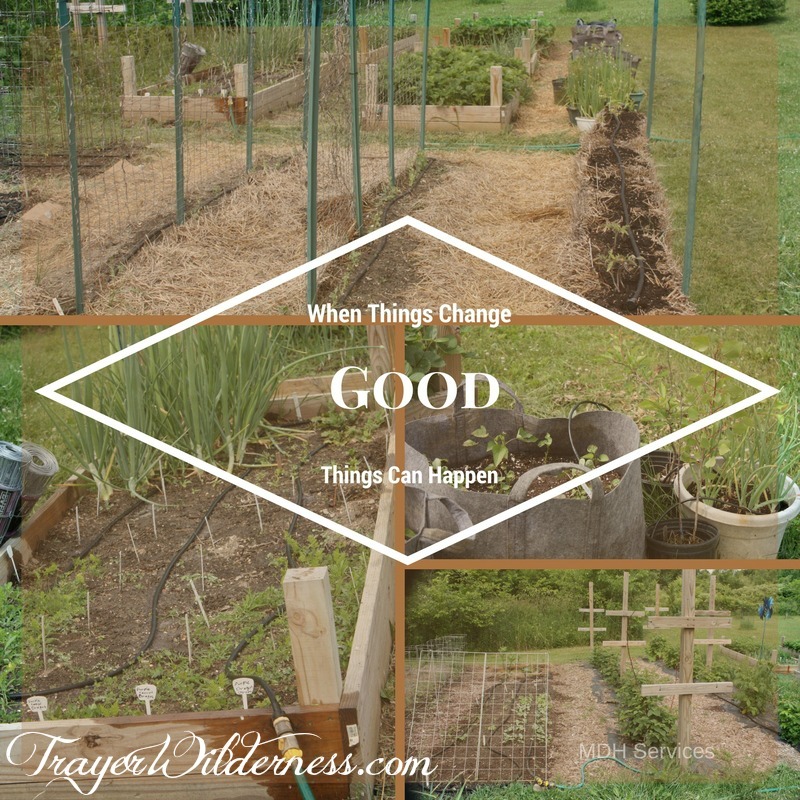 When I mulch in the fall, weeding takes far less time than when I don’t mulch. Below is an example of an area that was mulched next to an area that wasn’t. See the difference there? So one thing I plan to do this fall is to mulch all my beds and raised rows. It will save me hours in the spring. If it weren’t for my Mom, daughter, and husband helping me weed this spring, I may not have gotten my plants in on time. And yes, they all will reap the benefits of their hard work in the way of produce from the garden. In my previous post, MORE Was My Catalyst, you read about how I got started on my journey and the progress made. Now that I have another year under my belt I still feel like there is so much to do. Initially, I thought that we’d be able to get everything how we wanted it within three years. Yeah, not so much! So let me tell you about our goals for 2015. Our plan was to get chickens in the spring, put up a pole barn or update our garage, put in a greenhouse, start seedlings for the garden, add to the orchard to include some nut trees, plant grapes, hardy kiwi, rhubarb, blueberries, strawberries, and cranberries, as well as expand the garden with raised beds and in ground. 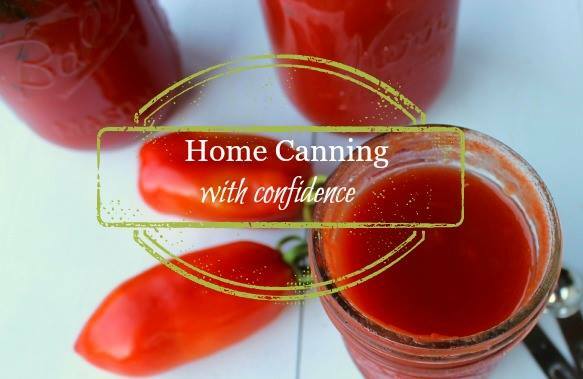 Additionally, I wanted to increase the amount of canning to be put up to not only include things like fruits, veggies, and broth but meat as well. And the plan was to do all of this in addition to our normal everyday things, stock up on wood for the winter to keep our heating bill down, and a couple week long vacations (we don’t usually take more than one so this was an exception for 2015). Pretty aggressive right? Do you think we accomplished everything? Nope. Not a chance. What do you think was our set-back? Our set-backs were money and time. So typical right? The year started out well for the most part. 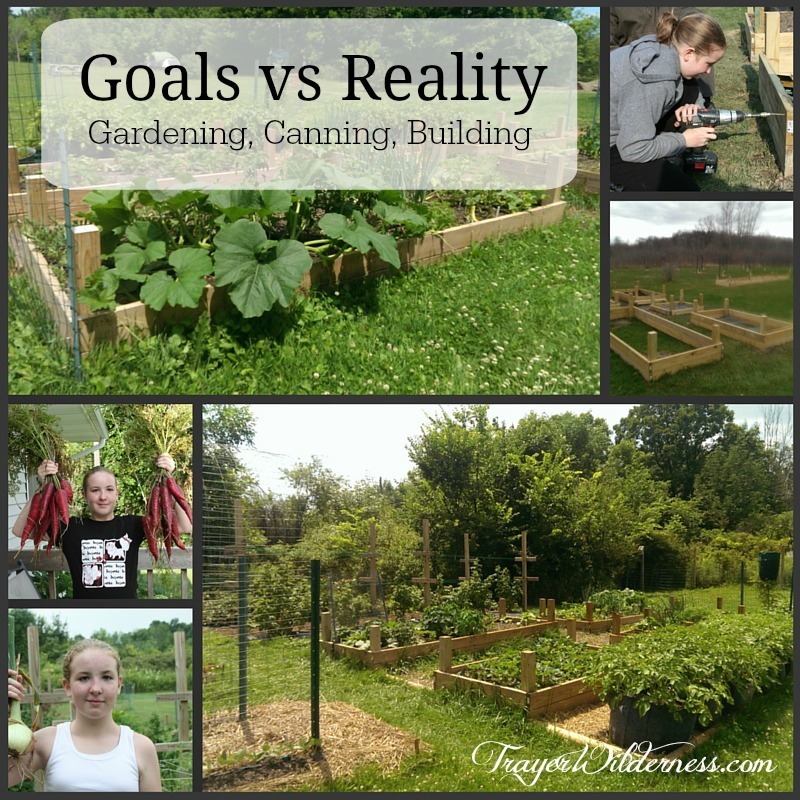 The garden plan was created with the knowledge that the raised beds would be finished in the spring (hubby started in the fall but with getting firewood ready for winter he wasn’t able to complete that particular project). The seeds were planted during the correct time according to the garden planning calculator from Seeds for Generations. 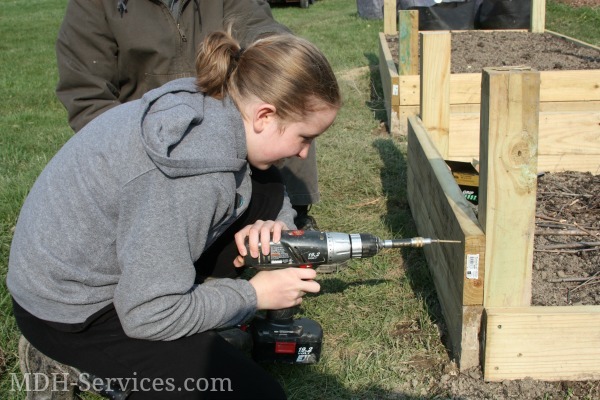 Finally, when the weather cooperated, the raised beds were completed. We put in two 4X12, two 4X8, one 4×24 and one 4×4. The 4X4 was claimed by my daughter so she had a hand in every step of the building of it. Now, can you imagine filling those darn things with soil? It was back breaking work using the wheelbarrow but I did it with a little help from the family. But before I did that I put some wire down in the bottom to prevent moles and such from disrupting the plants during growing season. Next I threw in some small branches (my version of hugelkultur) with the soil/compost mixture on top. Around the time that the raised beds were being finished a friend of ours contacted us and asked if we wanted a free pole barn. Who can say no to that?? The catch was that we had to dismantle it. So we made a trip out to the farm where it was and found that there was a small shed with some damage to the roof and sides that needed to be removed as well. And we could have that for free too. My husband worked tirelessly to get everything taken apart and brought home. The only problem is that it took away from his time to find and cut wood for the winter. 2015 was also the year that my best friend got married so I made a trip out to Nebraska during prime planting season, over Memorial Weekend, to spend a week with her. Because of this trip, several plants were delayed getting into the ground. 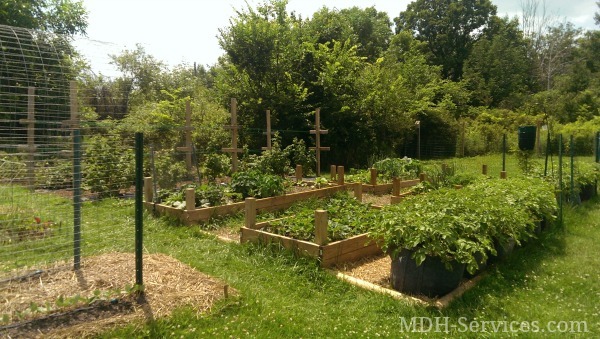 And then there were nutrient deficiencies in a section of the garden. And come to think of it, the seeds that I planted in that section in 2014 never took off. So that may be why. I normally don’t buy anything to add to my soil but I had to make an exception in this case because my tomatoes were severely stunted and sickly looking. After a quick internet search to figure out exactly what the deficiencies were, I used a combination of things for this area: bone meal for phosphorus, crushed egg shells for calcium, and an Epsom salt water spray for magnesium. My tomatoes started doing better but my harvest still wasn’t very good due to the combination of late planting and then having to fix the nutrient deficiency. One of the best parts of the summer was spending time with my daughter picking strawberries and then preserving them by canning, dehydrating, and freezing. While we planted both 4×8 raised beds with strawberries and they filled out nicely from the runners I’m not convinced that we have enough for this family. I may have to find a spot to put in a big patch. Good thing is that I won’t have to purchase strawberry plants anymore. Those plants send out a ton of runners! August was extremely busy with canning new things. I never knew that when processing corn that it smelled like buttered popcorn. And no butter was used! It took a bit of time because there were so many pints filled. And trying to remove the pit from peaches was a difficult task for me. I’m sure it was user error though as that was my first attempt at that. One of the jams that I made using the peaches was the Maple Vanilla Peach Jam found in the Preserving with Pamona’s Pectin book which is great on waffles! We have an apple tree on our property that was there when we moved into this house in 98 which we always thought was a crabapple tree. It wasn’t until a few years ago that we realized that it wasn’t! I took the plunge and decided to make applesauce with the windfall apples from it and was pleasantly surprised at how good it was and how little sugar had to be added. Those apples are absolutely perfect for applesauce. I’ll be making applesauce every year from now on. And the apple butter from those apples? Delicious! My daughter’s little garden did really well. She had decided to grow onions, carrots, cucumber, and a small pumpkin. The pumpkin seeds never germinated but everything else grew well. The onions were huge! 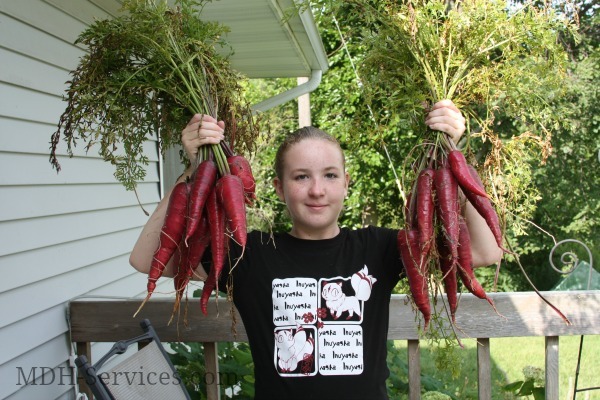 The carrots were a cool purple color (Purple Dragon from Baker Creek Heirlooms (rareseeds.com)) and grew big. In fact, we used them on the veggie tray for my husband’s 40th birthday party and everyone loved them. Canning chicken is a long process due to the processing time and with the amount I had it took me well into the early morning hours (like 3 AM early). After having this experience as well when I canned the corn, I decided I needed to have two pressure canners. I can’t fit two on my stove side by side but I can remove one and put the other on to get it going while the first one is depressurizing which still saves time. I love having Amazon Prime and being able to get my order within two days. I now have two Presto canners . Since I have a glass-top stove the All American Pressure canner can’t be used. Always refer to your user manual to verify if the Presto canner can be used on your glass-top stove. Whatever you do, don’t slide the canner across the top of the stove. Unless you like the scratched look. 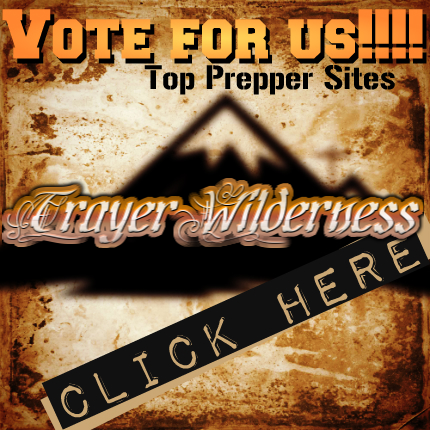 Wondering how we’re doing on the chicken coop and pole barn? Well, we have the pieces here except the big metal siding as we need to borrow a flatbed trailer for that. And everyone’s schedule just hasn’t worked out to make that a reality. So nothing has been built. And how did we do in gathering wood? Well, if it hadn’t been for my brother-in-law, it would have been a cold winter. He gave us at least 4 face cords even delivering some of it himself. And a co-worker of my husband’s knew of someone who needed a tree removed. The best part was that it was already felled and mostly cut up. We’re very fortunate to have others looking out for us. We ended the year with a road trip to Hilton Head Island, SC where we enjoyed some unusually warm weather and got to see dolphins. It was awesome! There’s nothing like spending that week between Christmas and New Year on vacation (we left Christmas night and returned on Jan 3rd). During the trip I reflected on how the year went and what’s ahead. I’m happy to say that I TRIPLED the amount of food put up! In 2014 it was 106 jars and 2015 was 320! 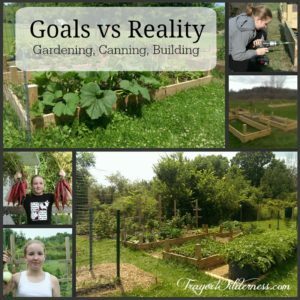 It truly was a busy year of learning and growth from starting seedlings effectively for the first time out of several prior attempts, making food from scratch, preserving enough to feed my family to being more realistic in our goals. While we didn’t get the pole barn built or the garage fixed up we did have to get a small inexpensive shed out of necessity. I hope 2015 was a good year for you and am really looking forward to all the good things to come in 2016. What is on your list for 2016?